Posted March 26th, 2015 by admin & filed under Uncategorized. Established in 2011, Ilundi began out of a need to find a well-priced, quality-manufactured leather bag to carry textbooks in. With no shortage of talent, Safia Stodel started designing and making her own bags. Soon, friends and family ordered designs, and she started supplying local boutiques with her handcrafted leather goods, while working out of the small converted garage she also lived in. Now operating from Woodstock, in Cape Town, the 100% South Africa company currently supplies two national online boutiques, eight boutiques within South Africa, and two boutiques abroad. And if she won the lotto…oh my heart, you’ll have to read on to find out. Being a sucker for local design and showcasing local entrepreneurs, The Sun House had to know more about the company. 1. Safia, I love your work. Please tell us what sort of products you make and if you also provide services? We handcraft leather bags and accessories. Products are hand stitched, hand woven and hand punched. We fuse modern technologies and silhouettes with artisanal leather techniques to produce unique, interesting pieces. 2. Where do you find inspiration for your creations? I draw inspiration from many different aspects of my life. My surrounding environment has influenced my designs a lot. Nature, art, books, Japanese minimalist aesthetics, the urban landscape and vintage craft books all play a part. I am also inspired by the transient and abstract. Certain cut out clutches from the Geometria range, for example, have been influenced by a fictional tropical paradise that I imaging myself being transported to on wintery days. 3. What are some of the challenges of being your own boss? Putting enough time aside to work ON the business and not only IN it. Also, when the business grows I always find it challenging to let go of the control of certain roles and just surrender. 4. How do you perceive the South African creatives/design landscape? I am incredibly proud to be a part of the South African creative and design landscape. It is filled with such incredibly unique, innovative and awe inspiring designs and talent. What inspires me the most are the stories of South African creatives who have embraced the traditional and artisanal ways of making, creating sustainable businesses that empower others along the way. PS: Safia is being modest, but Ilundi was showcased at this year’s Design Indaba and it was a firm favourite. 5. What is your favourite colour/ material to work with, and why? 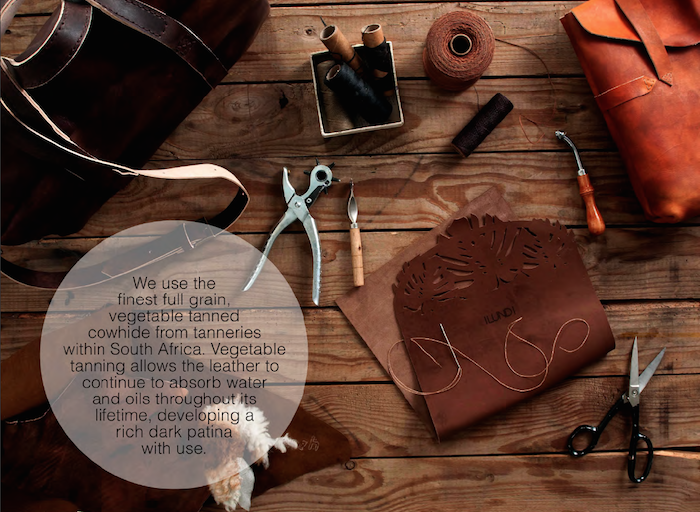 Natural vegetable tanned leather is my favorite as it is such a versatile material. It can be pigmented, spray dyed, and hand dyed. If left natural and treated with oil, it develops a dark caramel petina with age and softens beautifully. It is perfect for embossing and branding with heat. It can be moulded to shape, and stitched, folded or riveted together. 6. What would you do if you won the lotto? I have always been passionate about identifying and honing talent that is otherwise overlooked. If I won the lotto I would love to start a craft, design and entrepreneurial training centre to empower disadvantaged youths and assist them in transforming their talent into viable careers. 7. Where to from here? We plan to expand the brand to Europe. 8. What has been your proudest moment since you started? Representing our country on various worldwide online design platforms. Also, our very first international order was pretty amazing for us at the time!